Many tourists have been aware of the beauty of Alor Regency, belongs to Indonesia. Instead of the main island (Alor Island), tourists may find other small islands located near to it including the one called Kepa. In terms of region, it belongs to Northwest Alor Sub-District. Even though it is not quite popular, the beauty never fails to amuse visitors for sure. This explains why more tour agents recommend Kepa as the next vacation destination to those who are looking for a pristine panorama of the sea and serene nuance. How can people describe Kepa Island? In a nutshell, it is the combination of beautiful beaches and unspoiled environment. Thus, tourists may find some good spots to enjoy water sports there (including swimming, snorkeling, and diving). The formation of coconut trees and other beautiful plants grow abundantly on the island as well. Plus, some green hills reside in different parts of the island waiting for trekkers to get visited. Another good thing is that the island is a little bit secluded, so it offers a peaceful nuance to visitors. It is because only a few villagers live there. In a nutshell, Kepa Island looks desolated due to its secluded location. Another reason is that Kepa is way too far from civilization. Despite the condition, tourists are interested to visit the island due to the serenity. It is because they want to enjoy the unspoiled and pristine environment. Not to mention tourists want to find peace and spend an undisturbed vacation at available cottages. The unique thing is that the structure of the cottages is similar to that of traditional houses of Alor Tribe, built on a cliff near to beaches. The next allure of Kepa Island is none other than the beautiful beaches. These natural attractions offer both beauty and peaceful nuance. The sea scenery looks amazing due to its crystal blue seawater and calm wave. No wonder, most visitors are likely to enjoy water sports there including swimming, snorkeling, and diving. The others, though, want to enjoy more casual activities like beach walking and photography. Well, regardless of the activity, the beaches of Kepa Island may satisfy everyone. According to the locals, there are about 42 diving spots for tourists to explore. Not to mention the location is quite near to each other. Have no worries. Visitors don’t need to carry their own equipment as they can rent it at La P' tite Kepa inn (the most recommended place to stay and rest in the island). From Kupang City, it takes a flight for about 40 minutes to get to Alor Island Airport. 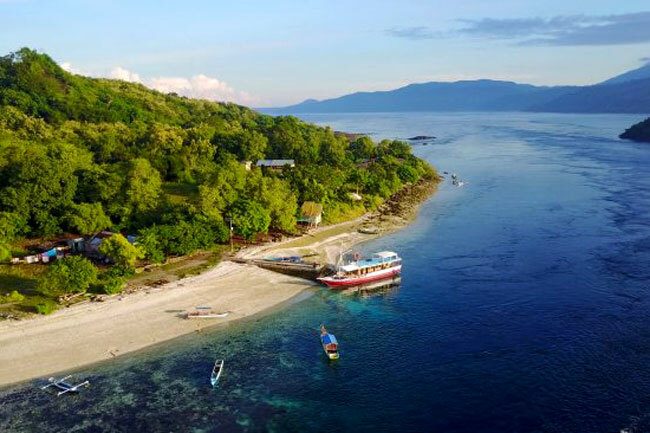 Once arriving at the destination, tourists should head directly to Alor Kecil Village in order to rent a boat. Make sure to get the schedule of the boat first before heading to Kepa Island, though. For the information, a single boat is able to accommodate about 30 people at once.